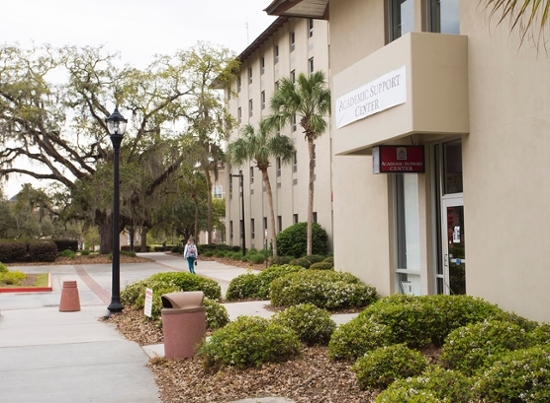 VSU's Academic Support Center is located in Langdale Hall. VALDOSTA — Valdosta State University’s Student Success Center is now the Academic Support Center. The renaming was made to distinguish the Academic Support Center from VSU’s new Division of Student Success, led by vice president Dr. Rodney Carr. All the services offered at the Student Success Center are still offered at the Academic Support Center. Those services include free one-on-one and small group tutoring to VSU students for undergraduate courses and popular standardized exams; tutoring for the community at a reasonable fee; workshops on academic and life skills; and technological assistance, such as how to use Microsoft Office Suite products. The center also provides supplemental instruction leaders to lead peer-assisted study sessions for various courses. The Academic Support Center will remain housed in Langdale Hall, but plans are in place to relocate the center to the second floor of Odum Library within the next year. The Academic Support Center also plans to expand the number of supplemental instruction leaders to include a wider range of courses. Those interested in scheduling an appointment at the Academic Support Center or applying for a job as a tutor or supplemental instruction leader should visit www.valdosta.edu/asc, call (229) 333-7570, or stop by the center in Langdale Hall.